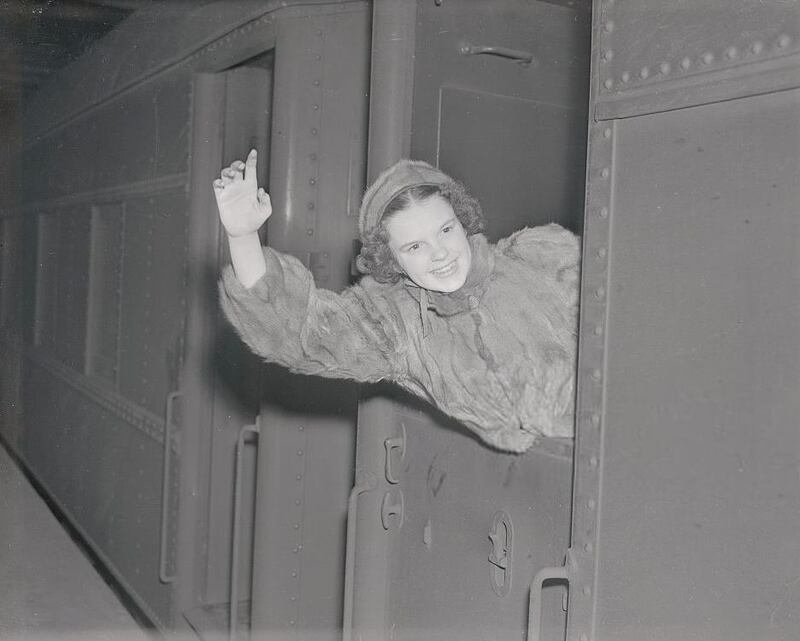 April 4, 1938: Judy was traveling home on the Super Chief from Chicago to Los Angeles after her successful Everybody Sing tour of parts of the East Coast and Midwest. The train (which was the “Atchison, Topeka, and the Santa Fe” line) made a scheduled stop in Albuquerque, New Mexico, during which the Albuquerque Journal reported that Judy stepped off the train to stretch her legs and purchase a postage stamp. No photos were snapped of her, that we know of. Included here is a photo of Judy arriving in New York that previous February for the same tour. April 4, 1940: Work on Strike Up The Band continued with a rehearsal of the “Our Love Affair” number. 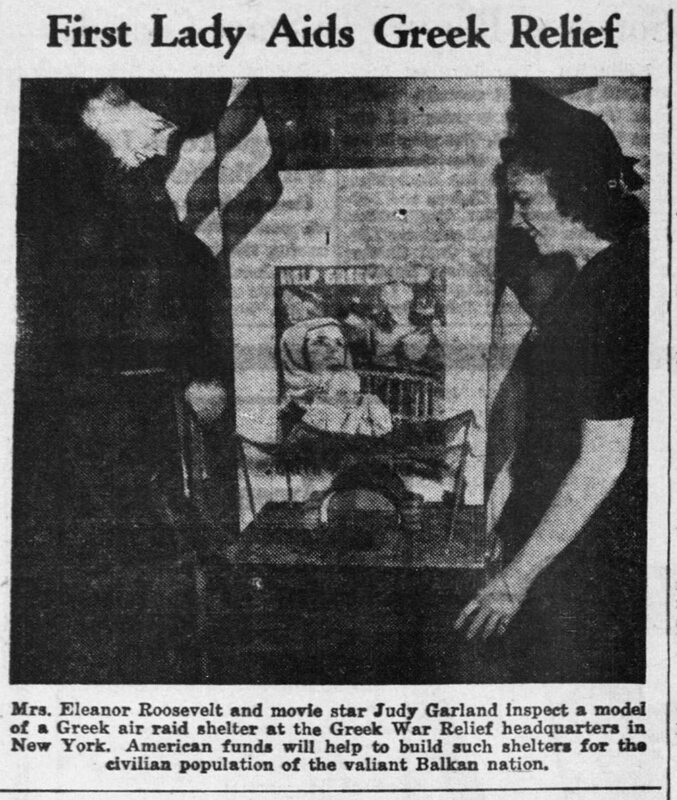 Time called: 10:00 a.m.; dismissed: 3:45 p.m.
April 4, 1941: This photo of Judy and First Lady Eleanor Roosevelt ran in papers off an on during this time. 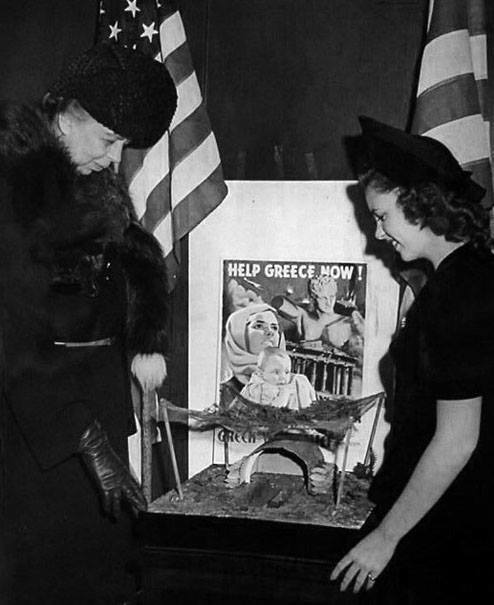 The two are at the Greek War Relief headquarters in New York posing with a model of an air raid shelter. There’s little information about Judy’s New York trip taken at this time. 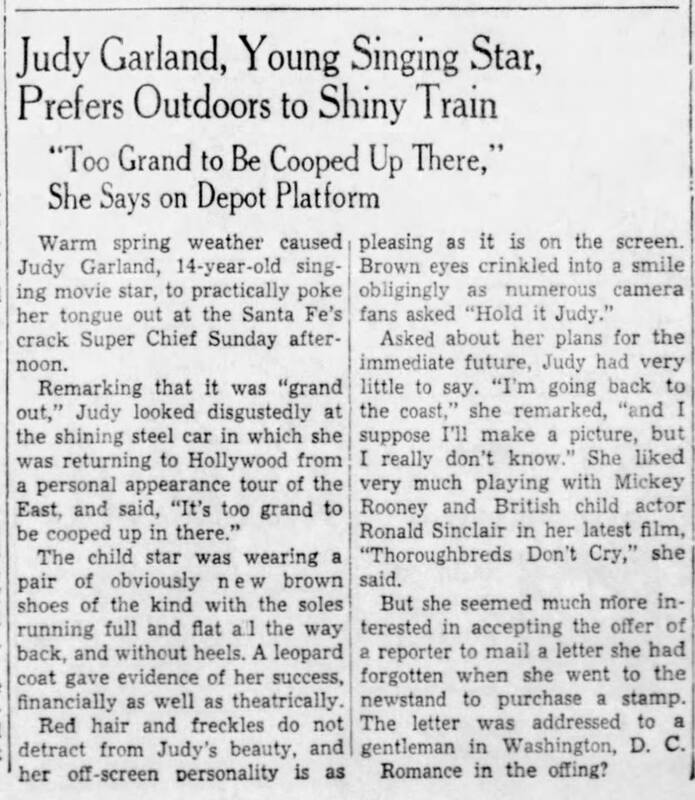 Amazingly, Judy had the time having just completed Ziegfeld Girl in March with no noted work on the upcoming production of Life Begins For Andy Hardy until May. 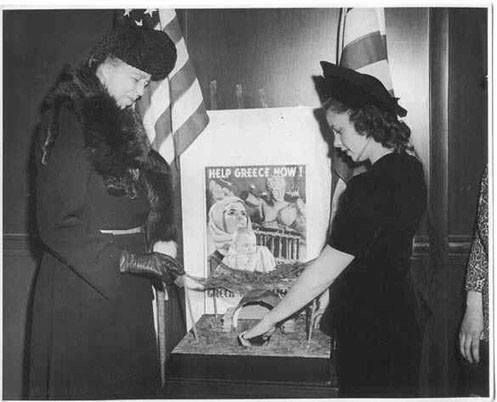 That previous February 25, 1941, Judy took part in the Greek Resistance Benefit in Los Angeles. She sang “Over The Rainbow” with composer Harold Arlen at the piano at the Greek Resistance Benefit, Los Angeles, California. Judy also sang “It’s A Great Day For The Irish.” David Rose conducted the orchestra. Check out the new CD set “Judy Garland Sings Harold Arlen” here. April 4, 1942: For Me And My Gal filming consisted of scenes on the “Interior Bijou” set, noted as the “tramp act” (Gene Kelly’s dance which was his debut dance in films) and the “Doll Shop” number. Time called 1 p.m.; dismissed: 6 p.m. Check out The Judy Room’s Filmography Pages on For Me At My Gal here. April 4, 1944: Filming on Meet Me In St. Louis continued with scenes shot on the ‘Interior Living Room, Stairs, and Hall” sets. Time called: 10:00 a.m.; Judy was ready at 10:36 a.m.; dismissed: 5:40 p.m. Judy also posed for some publicity photos for the film. 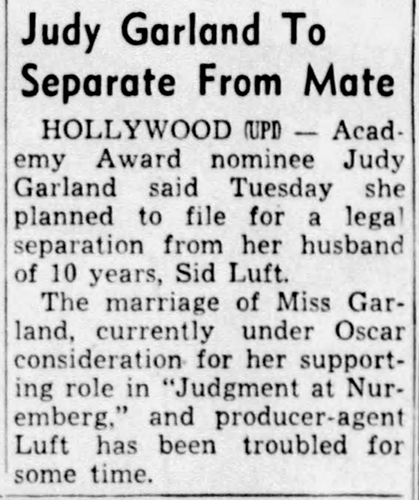 April 4, 1961: Judy had already completed her scenes for Judgment at Nuremberg when this and other photos began to appear in the papers. The caption makes note of her weight saying she’s “much more plump but just as pretty as she was at the height of her career 10 years ago.” Judy was again riding high, touring with her new one-woman show which reached its apex on April 23rd at Carnegie Hall. April 4, 2004: Judy’s daughter, Liza Minnelli, along with Judy’s Meet Me In St. Louis co-star June Lockhart, were on hand to help Warner Home Video celebrate the premiere DVD release of “Louis” (on April 6, 2004). The special two-disc set featured a brand new “ultra-resolution process” restoration of the film. It was the third film to receive the new restoration process. Check out The Judy Room’s Meet Me In St. Louis DVD page here. 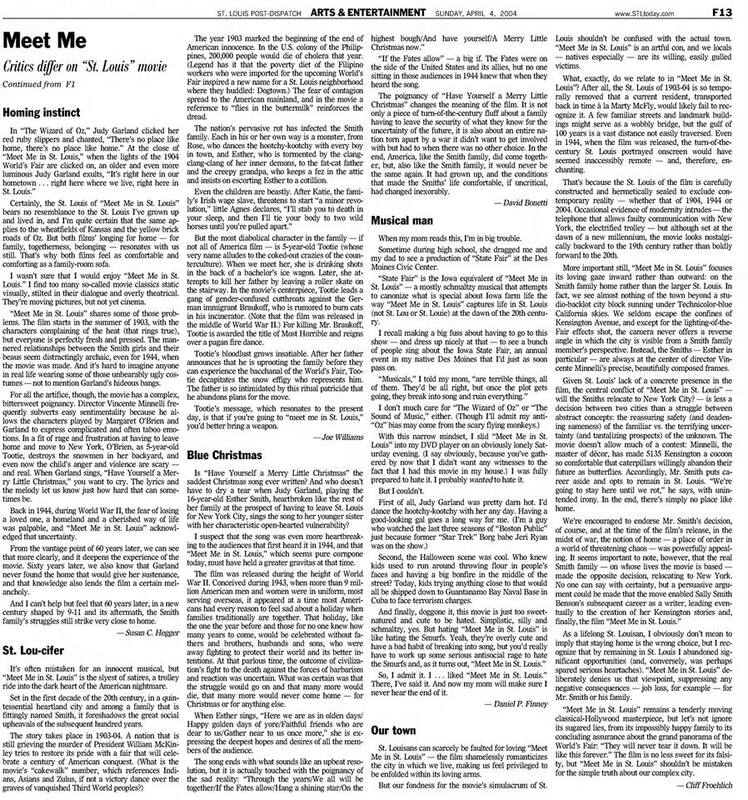 April 4, 2004: This trio of articles appeared in the St. Louis Post Dispatch, touting the new deluxe DVD set featuring the newly restored and remastered (via the “Ultra-Resolution Process) version of Meet Me In St. Louis. One reviewer gets the lyrics wrong to “Have Yourself A Merry Little Christmas” – bad form! The text of the first article shown above is below. To read the rest either save the images posted here or download the PDF. “Meet Me in St. Louis” is enjoying a renaissance in this centennial year of the 1904 World’s Fair. Our staffers take another look at what this classic really says to and about St. Louisans. Folks have been dropping by 5135 Kensington Avenue for more than 60 years – ever since Sally Smith Benson published the first recollection of her St. Louis child­hood in the June 14, 1941, issue of The New Yorker. 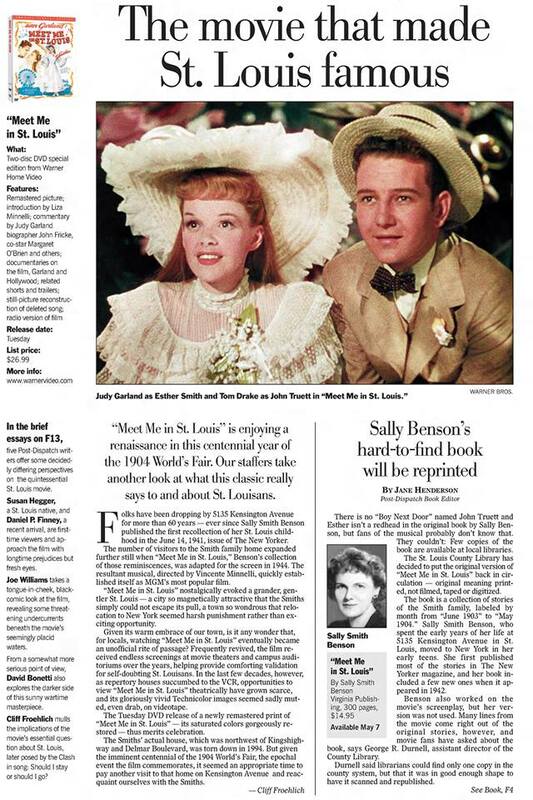 The number of visitors to the Smith family home expanded further still when “Meet Me in St. Louis,” Benson’s collection of those reminiscences, was adapted for the screen in 1944. The resultant musical, directed by Vincente Minnelli, quickly estab­lished itself as MGM’s most popular film. “Meet Me in St. Louis” nostalgically evoked a grander, gen­tler St. Louis – a city so magnetically attractive that the Smiths simply could not escape its pull, a town so wondrous that relo­cation to New York seemed harsh punishment rather than ex­citing opportunity. Given its warm embrace of our town, is it any wonder that, for locals, watching “Meet Me in St. Louis” eventually became an unofficial rite of passage? Frequently revived, the film re­ceived endless screenings at movie theaters and campus audi­toriums over the years, helping provide comforting validation for self-doubting St. Louisans. In the last few decades, however, as repertory houses succumbed to the VCR, opportunities to view “Meet Me in St. Louis” theatrically have grown scarce, and its gloriously vivid Technicolor images seemed sadly mut­ed, even drab, on videotape. The Tuesday DVD release of a newly remastered print of “Meet Me in St. Louis” – its saturated colors gorgeously re­stored – thus merits celebration.